As a college student studying organic chemistry among a load of other courses, you are likely a very busy person! And if you’re like me, you probably feel guilty every time you do something that doesn’t involve studying! Every day you have many mundane tasks to complete. While you would prefer to be studying, you can’t because you’re physically focused on something else, like commuting to work or school, doing household chores, walking the dog, food shopping, etc. I have learned that these little things require you to be physically active but your mind is actually able to absorb material while doing them if you listen to the material in the right format. One trick that I discovered during my undergrad years is how to maximize my study time by listening with my ears while doing something else with my eyes and the rest of my body. I used to live two and a half miles from school and I would bike ride to school slowly when the weather was nice. It took me between 15 to 25 minutes to get there. I would listen to music as I commuted until I realized I could be studying! At first I recorded lectures but I found the recordings to be of inferior quality and very hard to listen to, much less absorb. They were also too long and full of extraneous information. a 45-minute lecture recording contained too many minutes of non-study material. Everything from students asking about upcoming exams, and the professor telling about her college experiences. To solve this problem, I took my own notes during the lecture and then read them into a recorder at the end of the day. I would summarize all the key points so that I had the most pertinent information from the lecture. On my bike ride to school the next day I listened to my own recordings of the notes. This was really helpful because, whereas the lecture would take about 45 minutes or an hour to listen to, the relevant material from my own notes took only about 15 minutes. This commuting exercise (pun intended) enabled me to show up to class with material from the last session fresh in my mind and ready to absorb new information. The foundation was there so each session I could build on the knowledge previously learned. This routine made it so much easier to understand the material and to study for the exams. What about you? Do you have 15 minutes or more of mindless work each day? 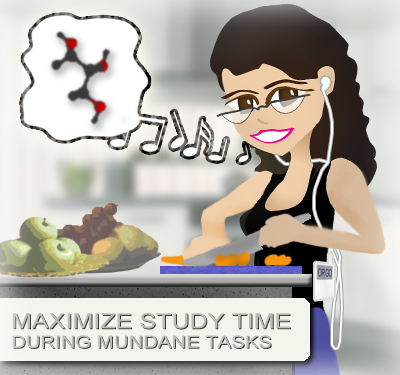 Would it help you to listen to your lecture and study notes when doing mundane work? In addition to recording your own notes, you could borrow and record a friend’s notes. Just make sure it’s someone who has credible notes. This way you have two different perspectives of the lecture to listen to. Another option is to record yourself reading the chapter summary and listen to that. Another valuable option is to record audio flash cards. If you have a long list of data to memorize, read them into your smart phone, digital recorder or directly into your computer and listen to them over and over again when you are doing a mindless task. This will make you more familiar with the words and their meanings so you can quickly recall the information when you begin to study, apply and practice, especially reaction mechanisms. Studying the mechanism repeatedly is great but you also need to know the name of the reaction and what goes into it. Once you have the audio, put in some earphones and the next time you’re doing something boring, listen to the notes once or twice. If you find this boring, increase the playback speed at 1.5 or even twice as fast and listen to it again and again until you are comfortable enough with the information and then see how much difference it makes until you actually sit down and study. The audio strategy works for both audio and video. Have you ever tried to watch a video such as my Orgo YouTube Videos on your phone or laptop while doing chores? If your computer is in a fixed location, you’ll miss out every time you step out of earshot. If playing on your phone, perhaps in your pocket, it continually shuts off if something touches the screen. As someone with ADHD, I cannot do chores without a podcast or video playing. If listening to a YouTube video I securely mount my phone on my arm so that nothing will touch and disrupt the video as I work. 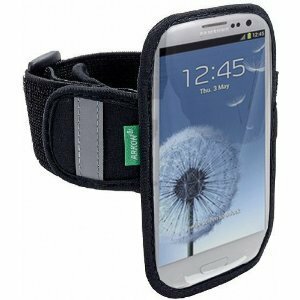 You can pick up a simple armband like mine on amazon. Turn chores time into effective study time. Find your favorite tutorial playlist, hit play, and get learning. Do you have time in your day that you wish you could be learning? Time when your body is busy with household chores or other physical tasks but your brain is bored, for example when you’re exercising, making dinner, washing dishes, folding laundry or walking to school? Start thinking now about the different ways you can utilize the tips above to maximize your study time. You’ll see significant improvement in the effectiveness of your study time when you actually sit down with your notes to study. The information will be fresh and familiar and you can focus on learning rather than trying to absorb ‘new’ information for the first time. How much time do you waste each day doing mindless work? I clean stalls for extra cash three days a week. Typically, I listen to music or an audiobook whilst cleaning (although some days I just need silence). I definitely could use this time, 2-3 hours, as time to listen to material. Sounds like 3 study days that would otherwise be wasted! My mother was just telling me this, she also suggested I play while I am sleeping. I’ve begun downloading the EK audio osmosis my computer and phone. Wonderful, Ashley! How is it working for you so far? I just purchased my armband. Now i’ll be able to workout without feeling guilty for spending 2 hours in the gym and 40 minute commute there and back. Thanks Leah! I love your lectures. I am preparing for a compoetitive exam at the age of 30 and your videos helps me a lot to get back my high school chemistry which i have almost forgotten. The best part is that you mentioned ur ADHD. Well, i am an ADHD too. I think ur study tips are very apt for me bcos I get bored easily with tasks and start dreaming with long letcures. So your short and split videos helps me a lot. I really get absorbed into it for hours. Many thanks! You really motivate me! I’m so glad to hear that, Thadsha! Keep up the great work! That’s awesome! glad to help. Which topics are you studying right now? Great advice Leah! I’m not sure how well that would work for me in orgo, but I will definitely do this for my biology class. I commute an hour and a half each day and all I do is listen to music, wasting so much of my time that I could be using to study. I found a youtube channel that summarizes each section of the book I’m using and I will download them now so I can listen to that during my commute instead of my music. I never would’ve thought of that on my own. Thanks! Great advice! Im listening to mcat audio osmosis to keep material fresh in my head until my exam, but im definitely going to record myself reading my notes for class next semester. Thank u so much Leah! It’s a bit tricky when it comes to orgo since much of what you learn is visual. However, even with orgo there are many terms, chemicals and general ideas that must be mastered in addition to reactions. Consider creating audio flashcards for reagents and terms, then watch a video on mechanisms to learn the what and how. Another option, since you mentioned taking bio this semester, do audio notes for bio freeing up more time to study orgo when you have time to sit down. I always have recorded lectures and found that you are completely right with lengthy recordings! My classes are usually about 2 hours long so if I listened to a recording it would be while falling to sleep or to skim through it to find the important points. I really love the recording your own notes idea it enforces you to speak the notes out loud and then listen along with reading them! Great advice! Thanks! That’s the idea, get your brain used to the concepts, then sit down to study properly. Which activities work best for you with this trick? You are very welcome. Which tip did you find most useful?